The Ford Transit is one of the most recognisable vans on the road. It's also versatile with three lengths and two heights available producing load spaces ranging from the smallest at 9.3m³ to the largest at 15.1m³ so that you can find the perfect fit for your business. 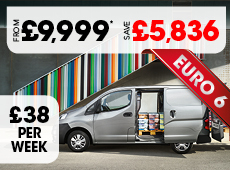 This van is capable of carrying payloads of over 900kg when you choose a FWD powertrain. This increase to over 1200kg with both RWD and AWD versions. The 2.0L Ford EcoBlue diesel engines are all engineered to meet Euro 6 emissions standards and can achieve up to 42.2 mpg. On the inside, the Transit is able to keep you well connected with new levels of functionality and connectivity that include the Ford satellite navigation system, DAB Radio. As standard, it receives Bluetooth handsfree technology so you can make and receive calls safely and remain focused on the road. THE TRANSIT VAN IS AVAILABLE FROM ONLY £223 PER MONTH. THAT IS JUST £61 PER WEEK!